For those of us who live in places where more than the average snowfall is guaranteed, clearing driveways and paths can be the very worst chore. It’s cold, it’s wet and you need to get the car out of the drive to take the kids to school and get to work, and it’s a horrible but necessary experience. 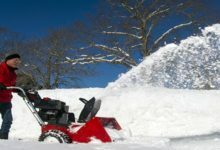 You may be quite amazed at how quickly a snow blower can clear a path and a drive, and how easy they are to use. As there are many to choose from, we’ve put together a review of a popular model, the Snow Joe iON18SB. Capability – Do You Need It? Before we get into the details of this model, a bit about how they work. It’s a simple concept: a set of blades scoop up the snow and it is delivered, quickly and easily, to a chute from which the snow is thrown out of the way – in this case, up to 20ft away, and through a 180bdegree angle in the direction of your choice. 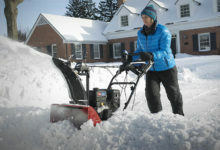 This cordless snow blower is particularly useful for domestic use. 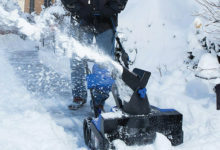 Snow Joe is the leading name in snow throwers and has been in the business many years, and the iON18SB is a cordless model for added convenience. Charge it overnight and you get up to 50 minutes of usage – more than enough to clear a good path – and as it weighs just 32lbs and has an adjustable handle, it can be used by just about anyone. 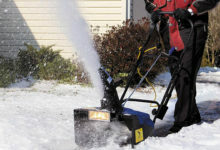 The Snow Joe iON18SB can clear a width of up to 18 inches in one pass and can move snow up to 8 inches deep. These are very good figures, and amount to a clearance rate of 495lbs of snow per minute. That’s plenty more than you can achieve with your shovel! Let’s have a look at some of the features of this model. First, this cordless model means you are not tied to a mains electricity outlet, as many snow blowers are. It is made to the usual high standard that the brand is known for, and there’s no tricky start-up procedure, you simply switch it on and go. This design comes with a fully adjustable handle that aids comfort when using for long periods. The very powerful, 40v battery is a durable lithium-ion design that provides plenty of power on one charge, for as much as 50 minutes use. The auger, to which the two rubber blades are attached, is steel and designed for long-time use, and the design is such that it will clear a path fully with no damage to the surface underneath. As we mentioned, the chute itself can be angled through 180 degrees; this means you can choose to deposit the snow as much as 20 feet away across any direction in that angle. 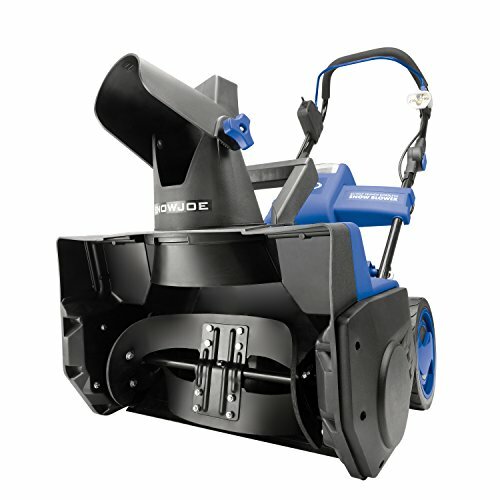 The Snow Joe iON18SB is designed for heavy snowfall – the 18 inch width and 8 inch depth are quite heavy duty figures, and somewhat greater than the standard machine of this type – and when not in use, will tuck away in a corner of your garage for the next snowfall and take up very little space. 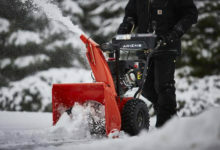 If you have already spent hours reading snow blower reviews then you will likely have noticed that there are many on the market to choose from, including a full range from Snow Joe. So is this model for you? 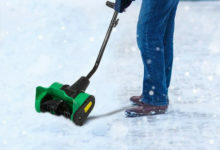 The Snow Joe iON18SB is designed for use in areas with more than average snowfall, or for those of you who might have a larger than usual area to clear on a regular basis. The wide and deep blades are very effective, and the ability to move almost 500lbs of snow a minute makes this one of the best-performing models we have reviewed. It’s notable that this design comes with a headlight, a 3-Watt light that will help you greatly on cold, dark mornings – and the fact it weighs just 32lbs is also a bonus. There are few cordless models that can give you the capability of the Snow Joe iON18SB, so it really is worth a detailed inspection, and at the price you will soon find it pays for itself in time spent with a shovel on freezing, wet wintry mornings! Are there any downsides to the Snow Joe iON18SB? If you want a snow blower with this level of performance, it is hard to fault. It is possible that some may prefer a mains-powered model, but that’s a personal choice, and it may be too large for smaller properties, in which case there will be a model in the Snow Joe range that will suit you better. 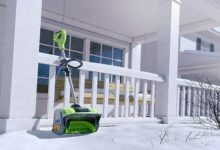 In short, the Snow Joe iON18SB is a very capable and powerful cordless device that comes from a top brand with a reputation for quality products, that can move a colossal amount of snow in a short time, and that is easy to use, light and sensibly priced. If you need to clear snow from your paths or drives – or any areas of your property regularly – we recommend this model. 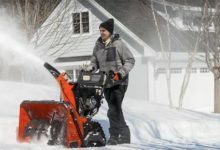 SnowBlowerGuides.com is a participant in the Amazon Services LLC Associates Program, an affiliate advertising program designed to provide a means for website owners to earn advertising fees by advertising and linking to amazon (.com, .co.uk, .ca etc) and any other website that may be affiliated with Amazon Service LLC Associates Program.